As as service to my Mama Sekhmet as well as to my Beloved Ptah, I would like to offer to any who request it a drawing of the Gods of the Year--this coming year that is--Mama Sekhmet and Ma'at. Ideally, I want this to be something I custom draw for anyone who asks, anyone who seeks to have an image of Mama Sekhmet and Ma'at in their home for the coming year. This will take time, but I want to do it, very much. I also want these to be free of charge, because I understand that finances can be very tight. However, if you are able, donations to the House would be greatly appreciated. Furthermore, I'm open to suggestions, if there's a particular way you want Sekhmet or Ma'at depicted. Drawings will be in the style of my Epagomenal offerings, as found . . . at the end of this post! Sorry, I made a boo-boo--check below for links to dA. ^_^ They will likely be a little bigger, simply because those drawings were done on 4 by 6 notecards, and I have some really nice 5.5 by 8.5 paper that I should use . . . I am humbled by your offering to us all. I love your work and would love to take you up on your kind offer. I especially loved your picture of Nebthet. I could almost hear her speaking to me. Second, thank you to everyone who's stepped forward recently! I'm truly thrilled to serve my Mama (and Ma'at!) in this way. I do want to clarify that this was intended as a service to Sekhmet and Ma'at, as They are the Gods of the year. For those who've asked for Sekhmet alone recently--don't worry! That's peachy! I don't mind and will 100% happily draw my Mama! However, as of right now I have limited time and spoons, and creating art for the Gods is a form of heka--a taxing one, at times--so, going forward, I want to devote as much time as possible to carry out this service as intended. Sekhmet and Ma'at, Together. This having been said, I also want to apologize to those who are asking for drawings now: I'm back at work full-time and still recovering from surgery, so I can't whip these drawings out as quickly as I could when I was just at home. It will take longer, but I will create them with just as much love and respect. <3 All the same, I beg your forgiveness and patience. Continued prayers for your post-op recovery, and for the inspiration to flow freely! Haha, thank you, Sedjfai! I really need to update my dA account--so much stuff is old and could really live in my scraps rather than my gallery. As a heads up to everyone (I will be sending PMs to folks who've already contacted me) . . .
Well, not all of them, but the ones I've been using for everyone's drawings (so no surprise, but I was hoping they would last). The ones I have left aren't colors I really use anyway, so . . . I'm going to look into getting a new set soon, but I want to get another paycheck under my belt before I do that (because markers are expensive(! ), and I work as a barista, heh) . . . which means it will be a couple of weeks. I'd be happy to dig out my colored pencils, if some of you want your drawings sooner than that. I have one example of colored pencil stuff on dA, which is, uh, fanart: https://jdylah--da--kylah.deviantart.com/art/I-Don-t-Want-To-Let-Go-666694267. I haven't used colored pencils a lot recently because markers are quick, but I used them exclusively for many, many years. Em Hotep! What a lovely art! Thank you for sharing your (beautiful) work with us! Thank you so much for doing this, Gezausenu. Your art is beautiful and it is a great service to our community. Hi, Gezausenu! I just wanted to stop in and tell you that your art is very lovely, and I think you're doing such a wonderful, kind thing! Oh, goodness. Truly, I don't know what to say, except thank you a thousand-fold for your kindnesses, all of you! <3 I've said it before but this is truly a wonderful experience for me to serve my Mama and also Ma'at. In so doing, in listening to how Mama and Ma'at want to be depicted in each piece, I'm learning about different sides to Them, different parts of Their personalities--and that is a wonderful, humbling thing! Em Hotep, your work is astounding! I am so grateful to have seen your art! You have given us such a blessing! Thank you for offering your services to the community! 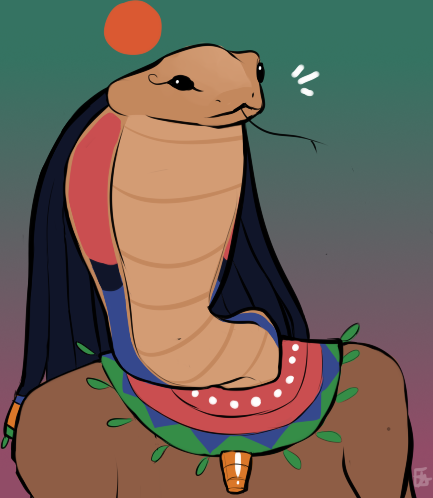 I was wondering if you would be willing to perhaps interpret Wadjet for me?